Jared Kushner and Ivanka Trump Blessed by Rabbi Who Calls Black People “Monkeys” | Have Ye Not Read? Israel’s Chief Sephardic Rabbi Yitzchok Yosef — who earlier this year compared black people to “monkeys” — is said to have blessed Jared Kushner and his wife Ivanka Trump before they attended the opening of the new U.S. Embassy in Jerusalem. Two years earlier, this same rabbi stated that all non-Jews — Africans, Arabs, or otherwise — could only live in Israel if they agreed to serve the country’s Jewish population. In other words, non-Jews must be slaves to Jews if they want to live in the nation of Israel. Can you imagine if Kushner and his wife had visited with a prominent southern racist preacher, or with a Ku Klux Klan leader, seeking fellowship and blessing from them? The outcry from the media would have been horrific and never-ending. But when Judaics are the racists, it apparently doesn’t count. You’ll barely hear a peep on CNN, ABC, NBC, CBS or Fox News about Kushner and Ivanka’s meeting with the racist, anti-black rabbi. And if you do hear anything, you can bet it will be quickly swept under the table. Such, for example, was the case in 2013 when Israel’s other chief rabbi, David Lau, castigated Israeli youth for watching sports broadcasts, stating that the sports players are “niggers.” When this was reported, the news media in Israel was condemned by Israel’s Minister of Industry Trade and Labor and of Religious Affairs Naftali Bennett for “hounding” Lau. And the kibosh was quickly put on the story. In other words, Jewish rabbinic literature such as the Talmud is highly insulting of black people. That’s a bit of an understatement, perhaps. After all, 12th century Jewish scholar Moses Maimonides, a man who for centuries has been considered to be Judaism’s most esteemed halachic authority (i.e., Jewish legal authority), taught in his book, Guide for the Perplexed, that blacks are actually sub-human in nature. But religious tradition handed down over the centuries by members of the Judaic religious community does indeed preposterously state that blacks are a cursed race. And over the long course of time, many Christians bought into that lie, and used it to justify black slavery. “The dogma that the black is a slave by nature is rabbinic in origin. Canaan is identified as a black man, and blacks as an inferior people, only in the Gemarra (the latter part of the Talmud), the Midrash and later writings of the rabbis. This invective…this racism… is not anywhere in the Bible concerning the black race. The rabbinic account of the malediction against Ham stipulates that Ham’s son Canaan, and all Canaan’s issue, are forever fated to suffer perpetual slavery and black skin, without the possibility of their condition ever being ameliorated. It is this anti-Old Testament rabbinic gloss that influenced those 15th century Renaissance humanists who had crossed over into the forbidden territory of the Talmud, Midrash and Kaballah as part of a supposedly enlightened act. It is an irony of history that as a result of this supposedly progressive development, the abominable view of black people as a congenitally-determined race of perpetual slaves became entrenched among the western liberal intelligentsia for at least the next 300 years. In other words, according to Jewish fables blacks are irredeemably cursed to be both black skinned, and slaves, because Canaan’s father Ham copulated with a dog while on the ark. Israeli Prime Minister Netanyahu then declared that the Israeli government would expel some 40,000 more African refugees from Israel, most of whom were Christians and Muslims. While the plan has been “temporarily suspended” by an Israeli court, Netanyahu has gone on to state that the African refugees are worse than terrorists — this, even though not a single African asylum-seeker in Israel has ever been charged with any terrorism offenses. 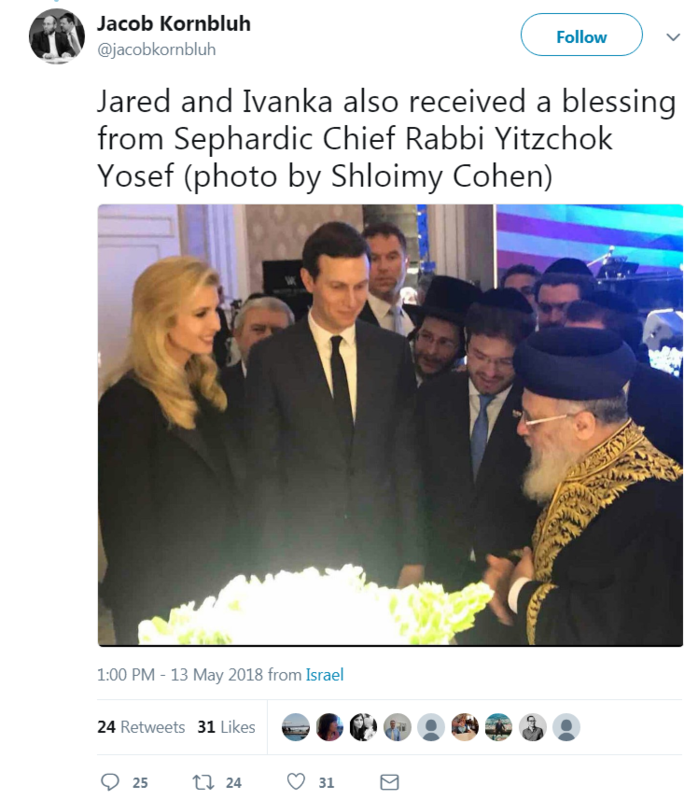 So I suppose it should come as no surprise that Jared Kushner and his wife Ivanka Trump (who converted to Judaism when she married him) would seek out the fellowship and blessing of the decidedly racist rabbi Yitzchok Yosef in their recent visit to Israel. Here in the U.S. Jews may be at the forefront of the civil rights movement. But in Israel…not so much, it would appear.